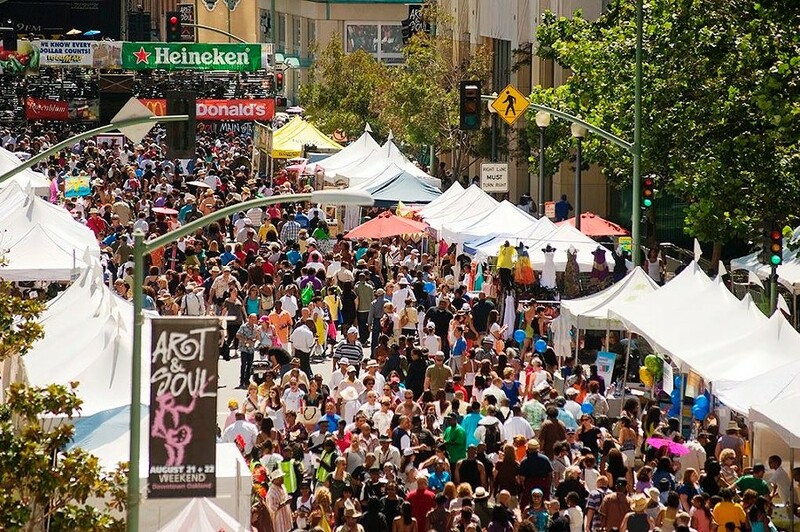 Art + Soul Oakland, the music and art festival that's an intrinsic part of summers in the Town, returns this weekend. Now in its 17th year, Art + Soul is continuing its tradition of honoring local musicians, artists and businesses. With the accelerated rise in festivals and an ever-changing landscape in downtown Oakland, a homegrown one that comes back year after year at an accessible price point and a commitment to highlight local talent stands out as special. Beyond the stage and art vending booths, this year's Art + Soul is also featuring brews from Oakland United Brewing and Temescal Brewing. On stage, Saturday's lineup features hometown hero Goapele whose latest project, Dreamseeker, is an evolution of the singer's neo-soul and jazz sound. "Stay", a nostalgic love ballad featuring BJ the Chicago Kid, stands out in its trap leaning beat that serve the singers' soulful voices flawlessly. Those of us who missed her weekend residency at Yoshi's back in May can celebrate one of Oakland's finest on Saturday. Also on the lineup for Saturday is East Oakland singer and rapper Adrian Marcel who the Express profiled this June on his path from record label restrictions to an independent hustle that's found him success and freedom. Marcel's performance at Art + Soul will be his first in his hometown since his last album, GMFU was released this spring. The project, which features production from Raphael Saadiq, travels comfortably from rap to R&B and back through 16 tracks. Taking the stage on Sunday is certified soul queen Angie Stone. Stone was last at Art + Soul in 2007 drawing the festival's largest crowds ever. Besides seven solo studio albums under her belt, Stone has also acted in stage productions, TV shows and films. Her set at Art + Soul will surely include her hits as well as classic covers infused with her soulful touch. Free for children 12 and under, $7 for 65+ and youth 13-17, $12 for adults, August 19-20. For full lineups and more information, visit ArtAndSoulOakland.com.